Without even realizing it, I was celebrating Summer Solstice... I was in the garden last night. Basil, in the foreground, and our red barn, waiting for our summer play. It was long passed time for the chard to get pulled up. Our winter and spring staple, which appeared in nearly every dinner, soup, and smoothie, had gone to seed and was resembling an old growth forest. The goats were the happy recipients of massive stocks, with still lush leaves. The chickens, too, will make good use of the leftovers. With the chard forest felled, the sunflowers really standout. I gave them a deep soaking. So far, we have been spared the worst of Southern California's record-breaking heat wave, but it is hot for June. 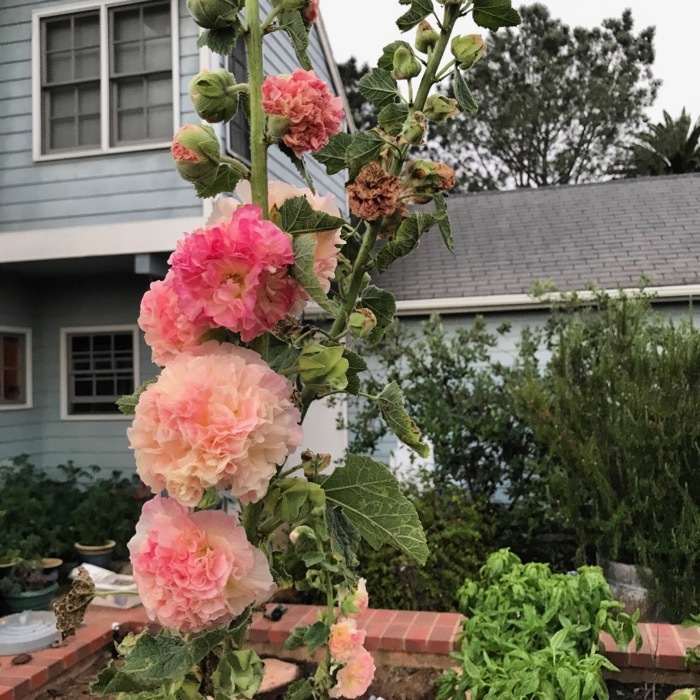 The hollyhocks hang on, still blooming. The tallest stock snapped at the base, possibly under it's own weight... it was about six feet tall. Now, I am going about the business of collecting the seeds, to share. To be honest... I am in a domestic slump. Worn out from our working weekend, which is satisfying and happy work, but requires days of preparations, and as much time to unpack and recover from. Plus I got sick, or I simply wore out my throat and voice. And, too, we've just had strange and difficult events, and setbacks, that while manageable, somehow have managed to derail the regular maintenance and upkeep required to keep a home and family on track. At the end of the day, or six months, I like to think we made the best choices, kept everyone safe and well. 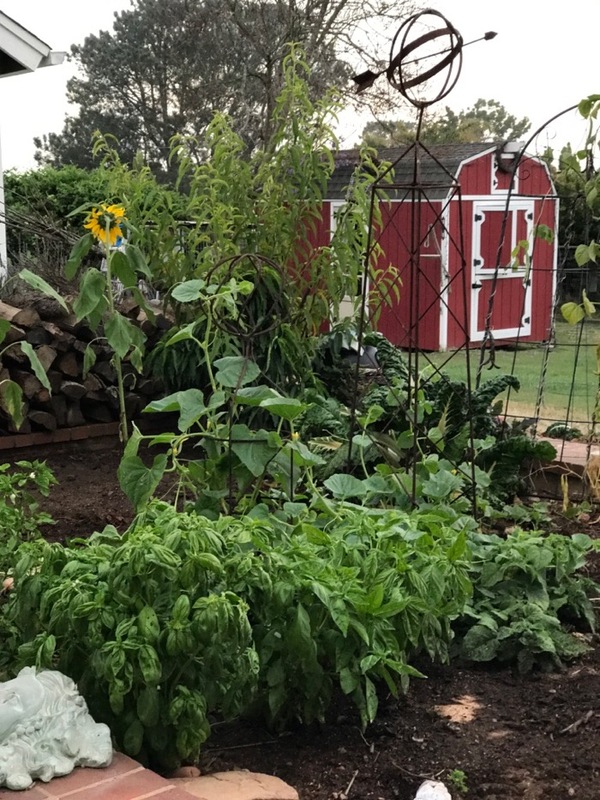 Dust and clutter happens, and sooner or later, we will tackle it all, but... well, last night my best choice seemed to be to putter in the garden. 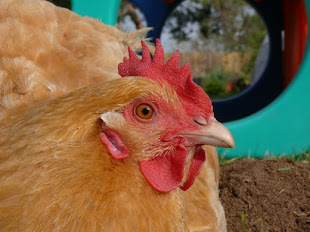 Pluck weeds, water seedlings, check the tomatoes, toss caterpillars to the chickens. Compared with what is left undone, I feel remiss, but ah, never mind. 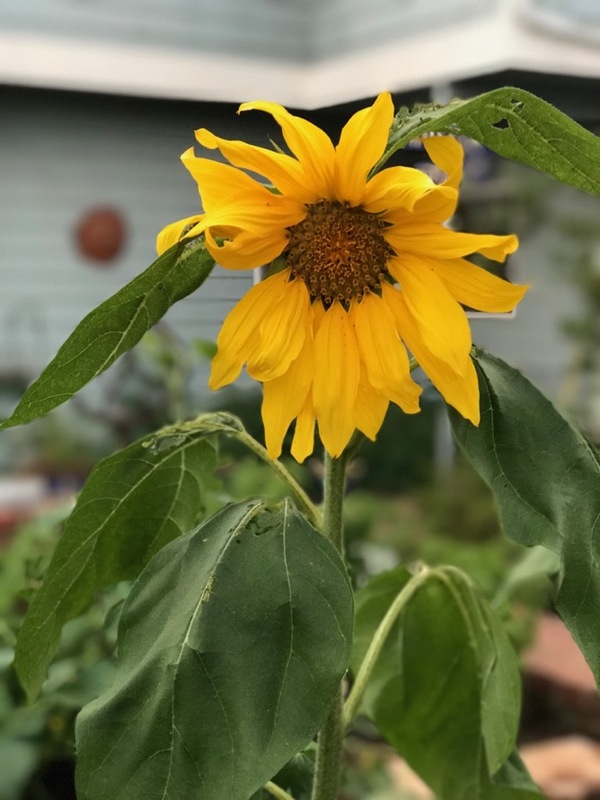 A garden heals, and restores, and reminds us that life is cycles. 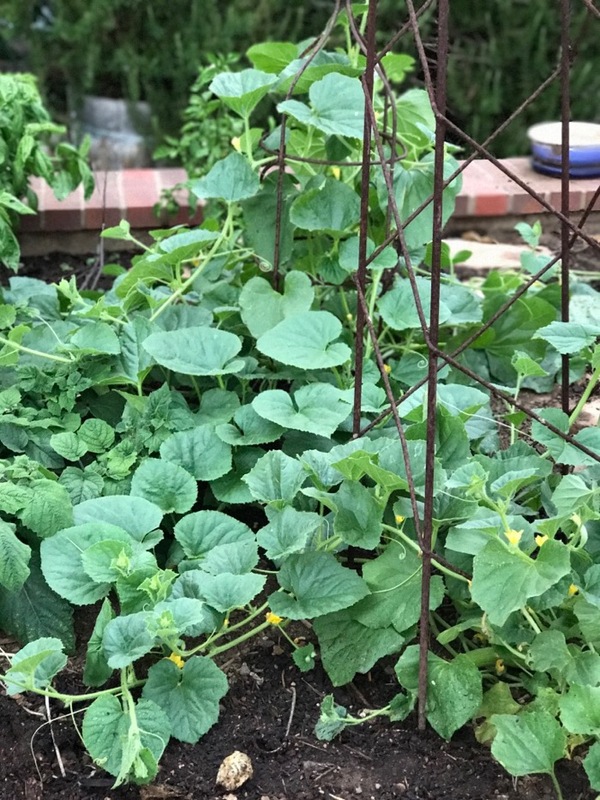 I've never had such a promising start to my cucumbers. Maybe it's the luck of the Junior Master Gardeners. We brought these home from the seeds they planted, tended, and sold. The tomatillo looks good, too. And Maria already enjoyed tomatoes on her sandwich. Only two, but tasty! 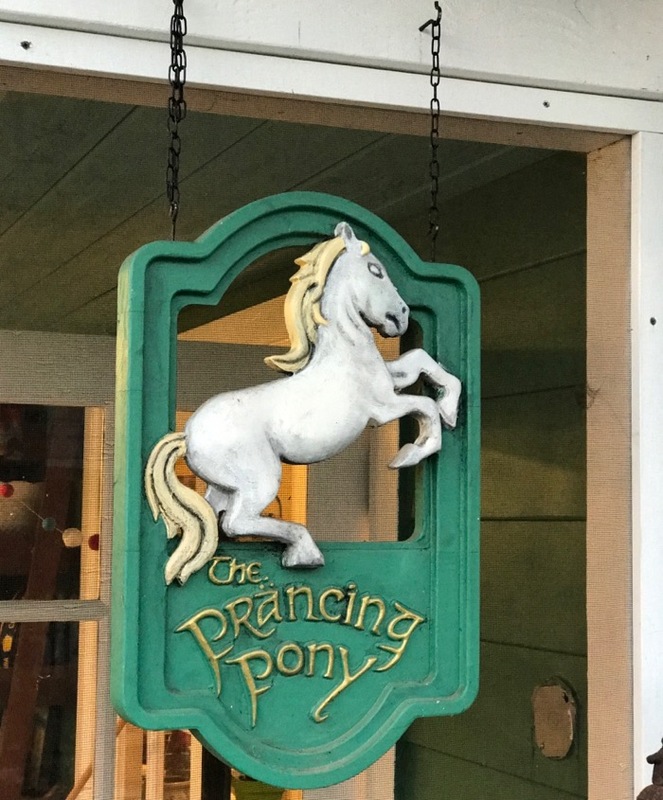 The sign of the Prancing Pony hangs facing my large garden bed, and I love to see it there, to be reminded of the things dreamed up, created, inspired, here at our Bird House. I would have liked to have made a party, to celebrate Summer Solstice. There are so many ideas, plans, aspirations, and even far-fetched ideals about the kind of person I should be, or could be... better this, better that, organized, fit, prepared, tidy, more hobbit, less troll. A hobbit would think it a fine way to celebrate Solstice, puttering in their garden, don't you agree? And a hobbit would most likely see a new season as a fresh start. Have you seen the making of our sign? William designed it from screenshots in the movie, The Fellowship of the Ring, then created the computer graphics for our CNC router to mill. He did such beautiful work finishing it, too. This is the router we call Frankenrouter, that Geoff planned and built. I love, and treasure, every time the calendar, or any cultural observance, gives us the chance for a new beginning. A new season there for you, already SO promising with all that's lush and growing all around you. I am sorry to hear mention of the difficulties, and hope that things resolve in the best possible ways under the circumstances. 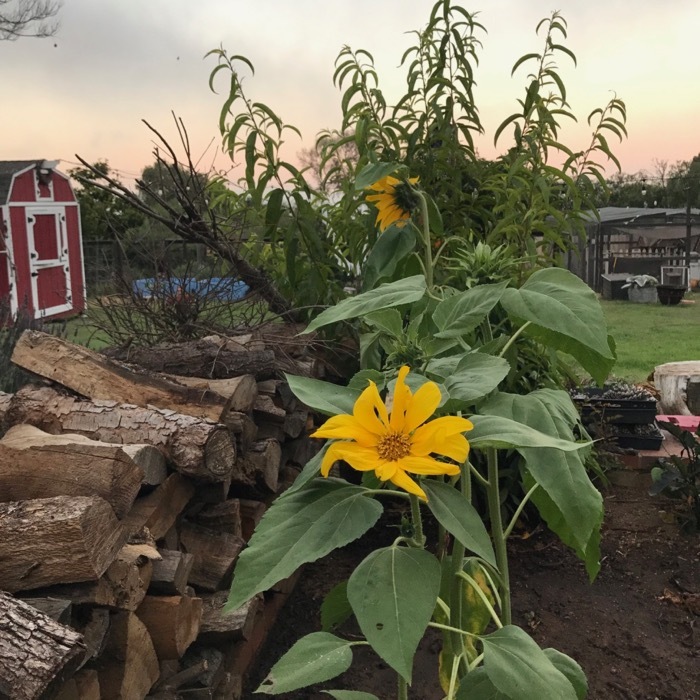 We sometimes say here at our house that the bestest reason to have a garden is to have a place to walk around in the early evening, to check on and putter over and -- breath in. You are doing all the things. Each thing you are doing is the right thing in the moment to be doing. There is no one path through the garden.